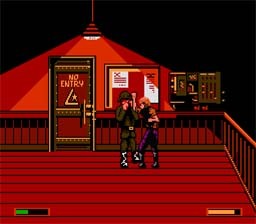 Never was there a name so apt as Bad Street Brawler's; not only is this game bad, but it plays upon the "bad" attitude of the '80s to deliver us some truly profound wisdom such as "Never Trouble Trouble Til Trouble Troubles You." 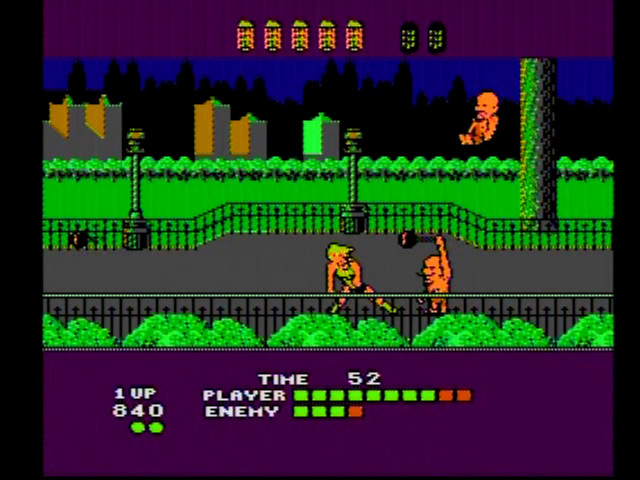 The gameplay is also pretty awful, giving you two moves per stage (as opposed to, say, all of them from the beginning or even taking a page from the original Double Dragon and having you learn new attacks based on a leveling system) and having you fight endless hordes of weightlifters, dogs and other bizarre opponents. But perhaps the truest mark of this game's quality is that it was designed for the Power Glove, a Mattel peripheral notorious for the fact that it simply did not work as advertised and actively made any game you tried to play it with at least a dozen times harder. Having it on allegedly allows you to utilize new moves, but when that comes at the cost of making the already twitchy controls even less responsive, why would you want to? One of many games brought to us by GameTek, a publisher primarily known for their games based on Wheel of Fortune and Jeopardy (as well as the infamous Robotech game for the Nintendo 64, which spent many years in development only to be cancelled as the company went bankrupt). They weren't exactly known for quality entertainment throughout their career, and American Gladiators is just another example of that. The game gives you five events to play - jousting, wall climbing, human cannonball, Powerball (think "capture the flag" and "assault" (overhead shooting). Which would make for a pretty fun game if they were enjoyable, but they also suffer from choppy animations, questionable hit detection and some truly grating music, not to mention outrageous difficulty. The only up-side of the package was a rather amusing digitized scream when a character was defeated and plummeted offscreen. Another underwhelming title from the early days of Atlus and LJN, T&C Surf Designs certainly puts on a respectable front with its large character sprites and colorful visuals. The same cannot be said for the gameplay, however. The game is split between two events - skateboarding and surfing - and unfortunately neither one is particularly fun to play. 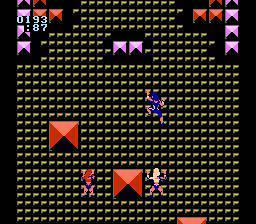 Both suffer from lousy controls, and those paired with the large character sprites make avoiding obstacles much harder than it really should be. You get eight lives per event, but they don't work as traditional video game lives usually do - taking a particularly bad fall can deplete two or even three lives from your reserve, and there's no way to get them back. There's also no real goal to the game other than to get a high score, so any thrill of accomplishment is quickly diminished there as well. 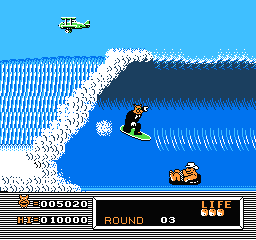 The NES did have some good summer sports games (Kings of the Beach, the original Skate or Die and California Games come to mind), but T&C was definitely not one of them. Before Square achieved runaway success with their Final Fantasy franchise in Japan, dominated the world in the Playstation era with Final Fantasy VII, then flushed all their success down the crapper with Final Fantasy X and X-2, they tried their hand in a few others field like racing games, 3D platformers and this, a weird hybrid of a platformer, an overhead shooter and an RPG. Collecting powerups will make your characters faster, boost their attack power or defense, or restore health. An interesting concept to be certain, but unfortunately, a good concept doesn't necessarily equate to a good game, especially when finding said powerups just equates to mindlessly blasting everything on the screen over and over again, including whittling your way through entire mountains one block at a time until you find something. 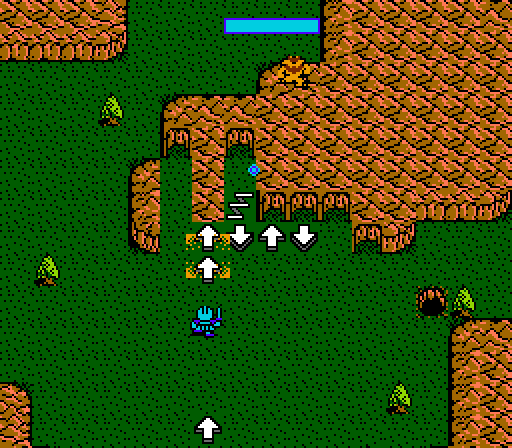 Being forced to slowly pace your way through hails of enemy fire through five extremely slow and repetitious stages doesn't make the action any more compelling, either. King's Quest is a decent idea dragged down by a completely lackluster execution. One of many licensed professional wrestling games released on the NES, but as this and many others proved, the genre still had a long way to go. Not that they weren't trying over at Rare, though - the game's presentation is top-notch, with colorful title cards and well-animated characters (complete with many of their signature moves), as well as spot-on 8-bit renditions of many of the wrestlers' themes. Unfortunately, the same could not be said for the gameplay. Slow-paced action, weird hit detection, and AI that literally cheats by giving itself super-speed and doing much more damage with attacks than your character can makes the game a chore to play. Not to mention missing elements present even in earlier wrestling games on the NES - there is no action outside the ring, and even basic controls like pinning vary wildly from character to character, making the game not only frustrating to play, but unintuitive as well. 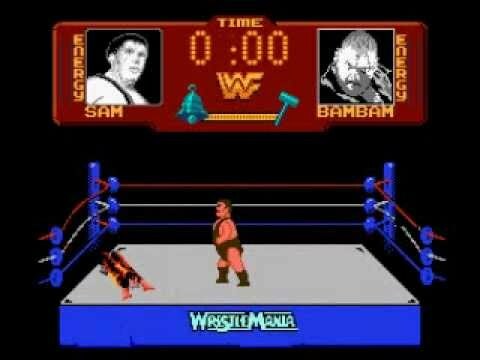 With games like this, there's a good reason professional wrestling video games never really became well-known and loved until the Nintendo 64 and Playstation rolled around. Just about everyone with an interest in old-school Computer RPGs will tell you that Ultima is one of the best franchises there is, and among them, Ultima 5 is definitely one of its finest. Not only did it effectively portray a world under heavy oppression by a corrupt king, but it also featured some extremely deep puzzle-solving, challenging dungeons and battles that were truly large in scale, making it a very difficult, though ultimately rewarding, experience. The NES, version, on the other hand, is a total insult, bogging down the gameplay, having much worse visuals and animation and a single 30-second music track that loops endlessly, making the entire experience almost insufferable. An intolerable mockery one of the finest CRPGs ever made, which is baffling because it's made by the same company that developed the original game! Even moreso when you consider that the two previous Ultima games' ports (Exodus and Quest of the Avatar) were honestly pretty good, staying faithful to the PC versions in design while also making them a bit more accessible to the generally younger console base. If you want the real Ultima 5 experience, then track down one of the computer versions instead and skip this turd. Cinemaware was a bit of an institution among PC gamers in the late 80s and early 90s, attempting to turn games a more cinematic experience with high-resolution character sprites and animations despite the limited hardware of the time. In that regard they were partially successful, creating games that looked fantastic and captured an epic serial-like feel, but whose gameplay wasn't quite as high-tier to match. Now take that concept and try to port it to a platform with much less to offer in terms of technical specs, and the results are... less than stellar, as Rocket Ranger proves. While the game still looks solid for an NES title, the gameplay does not follow suit, mostly just consisting of simple and repetitive minigames dragged down by clunky controls and questionable hit detection. Not to mention cutting several elements from the PC game, leaving behind a scaled-down experience of the original game with none of the benefit of its visual gimmick. More proof that Konami was playing both sides of the quality aisle with their releases, and even had no qualms about doing so with some of their most beloved franchises. 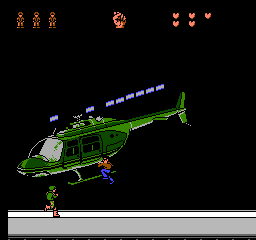 Contra Force is a spinoff of the Contra franchise, pitting the player, as one of four characters, against a team of terrorists. The game also includes a Gradius-style weapon upgrade system, though it's somewhat counter-intuitive in that your upgraded weapons are often harder to use than your standard gun (and you can't switch back without dying). 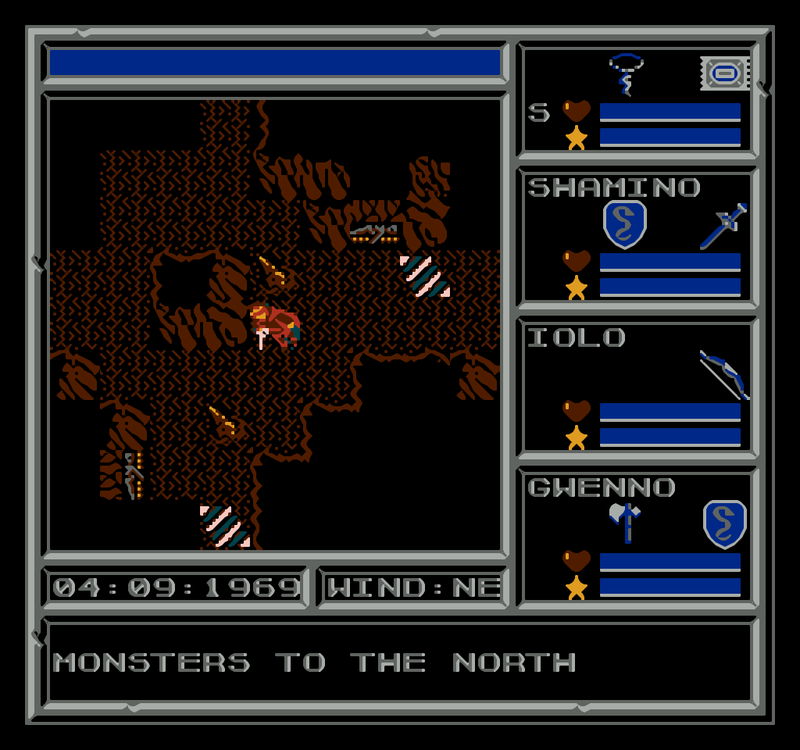 One can also summon a computer-controlled ally for a short time to attack enemies in order to do some damage while remaining relatively safe themselves. 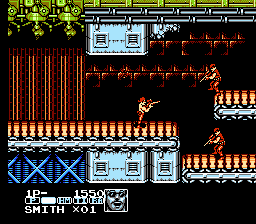 But for all its ideas, Contra Force plays absolutely terribly, having copious amounts of slowdown even with relatively few enemies onscreen and a marked lack of challenge, with most bosses being easily defeatable by simply finding a single spot outside of their attack range and firing away. To date, it remains one of only three Contra games never released in Japan (alongside the two notorious Playstation Contra games), and it's not hard to see why - because nobody there wants to play this crap!